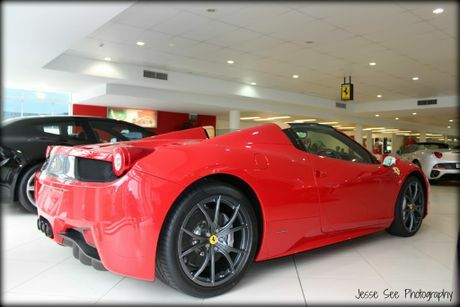 TODAY'S post is of a brand-new, 2012 Ferrari 458 Spider coated in a beautiful Rosso Corsa. As you may have guessed, this is the convertible version of the 458 Italia, and the only difference is the electric convertible hardtop roof, which makes it the world's first hardtop convertible, mid-engined supercar. A feature that I really like about this Ferrari is that when the roof is up and you look at the car from the side, you can't tell that it's the spider model, because of the roll bars behind the seat. In my opinion, the Ferrari 458 is the best looking Ferrari ever made, because every little detail is hand-crafted to perfection. The Ferrari 458 Spider has the same engine as the Italia, which is a 4.5-litre, 32 valve eight-cylinder engine which can produce up to 419 kilowatts (562 horsepower) @ 9000 rpm and 539 Newton metres of torque (398 pound-feet of torque) @ 6000rpm. Connected to the engine is a seven-speed dual-clutch automated manual transmission, with manual shifting paddles behind the leather and carbon fiber steering wheel, which then sends all this power to the rear wheels. Also, this particular Ferrari also has a curb weight of 1380 kilograms. The stunning body was designed by Pininfarina, and nearly every single angle of this Ferrari is aerodynamically designed, for instance the wings on the front bumper deform at high speeds to provide more downforce, the air vent above the front wheels allows air stuck in the wheel well to escape and the vents above the tail lights provides air for the engine. This allows the Ferrari 458 Spider to launch from 0-100 kilometres per hour in under 3.4 seconds, and it will keep accelerating until it reaches its top speed of 320 kilometres per hour (199 miles per hour). Some other features that this particular Ferrari is equipped with include all-new, 20 inch 5 twin-spoke alloy wheels wrapped in performance tires, Scuderia Ferrari fender shields, a limited slip rear differential, double-wishbone front suspension and multi-link rear suspension, a front and rear stabilizer bar, a front lifting system for speed bumps, four-wheel ABS as well as traction and stability control, dusk-sensing and auto-delay off Xenon headlights, electronic brakeforce distribution and emergency braking preparation, tire pressure monitoring, front and rear parking sensors, a premium leather interior with front bucket seats, a navigation system, LED rpm lights on the steering wheel and much, more. 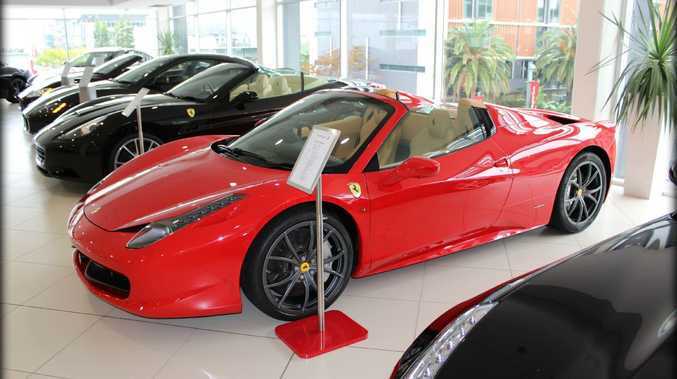 You can currently buy a 2012 Ferrari 458 Spider for a base price of about $A590,000.